If you’ve ever wanted to powerfully increase your energy and focus, you'll be interested in how phenylethylamine works. Also known as the ‘love-molecule’ and the chemical responsible for ‘runner’s high’, phenylethylamine is your brain’s most powerful stimulant. Found in small quantities in various food sources, people have incorrectly thought that chocolate and red wine can create the same feelings as falling in love. Taking a Phenylethylamine supplement can help to improve mood, focus, and energy. It gives a powerful but short-lived boost. You can lengthen the effects of PEA by taking MAO-B inhibitors or Hordenine. Phenylethylamine HCl is the salt form of phenylethylamine. This form makes it more stable and accessible. Based on user reports and experiences, and limited studies, the recommended Phenylethylamine dosage is usually around 100 – 500 mg once to three times daily. You can take a Phenylethylamine dose in the morning, before exercise, or at any point that you need some extra energy. You can take PEA multiple times in one day. There are a number of ways to take Phenylethylamine. Taking PEA sublingually (under the tongue) will allow it to be absorbed into your bloodstream faster. You could also take PEA with a glass water or juice. There is a complex biochemical pathway that produces phenylethylamine. The PEA ‘precursor’ is an amino acid called phenylalanine. People with depression and ADHD have lower than normal levels of Phenylethylamine. Scientists believe that schizophrenics have an excess of PEA. Our bodies regulate the levels of phenylethylamine strictly because it is such an important neurotransmitter. This is why we metabolize PEA at such a fast rate. It’s not really possible to get into your biochemical pathways and tell your body to produce more PEA. However, physical exercise and close social bonds are known to increase natural PEA levels. Phenylethylamine is broken down (metabolized) by enzymes called MAOs. Inhibiting these MAOs allows the effects of Phenylethylamine to last for much longer, and will let you appreciate this powerful substance fully. However, some MAO-inhibitors (MAOIs) can be very dangerous and have a number of interactions. The safest MAOIs are MAO-B inhibitors. These inhibitors work on only a few of the MAO enzymes. They’re much safer than MAO-A inhibitors and will still make Phenylethylamine work for much longer than normal (up to 5 hours). You can inhibit PEA metabolism by using a Hordenine supplement. Hordenine is extracted from the Chinese Bitter Orange fruit, and it is an MAO-B substrate (it prevents PEA from being metabolized). Hordenine also produces a number of other important health benefits. Taking Phenylethylamine with Hordenine is a powerful energy-boosting stack. Other natural MAOIs include nutmeg, turmeric, and kava. How much Phenylethylamine is in cocoa? The most important dietary source of PEA is actually food that is high in protein. Foods that are high in phenylalanine can be converted into Phenylethylamine. These contain soy protein, spirulina, egg whites, and tofu. Phenylethylamine is a neurotransmitter. It is one of the most underrated neurotransmitters in terms of the effects it has on your brain. Phenylethylamine stimulates the production of adrenaline, dopamine, and serotonin. It is very effective at increasing levels of catecholamines, which are neurotransmitters that include epinephrine (adrenaline) and norepinephrine. 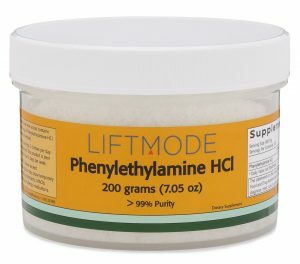 This is how phenylethylamine gives you the boost in clarity, energy, and focus. Furthermore, Phenylethylamine increases the production of dopamine and serotonin (mildly). These two hormones are very important mood regulators and are the reason why Phenylethylamine supplements boost your mood so powerfully! In conclusion, Phenylethylamine (PEA) is a powerful and natural stimulant. You take it in its salt form of Phenylethylamine HCl, usually in the morning or before exercise. If you want to lengthen the effects of PEA it is recommended to use Hordenine, as this is safer than using MAOIs. This is a great start for learning how phenylethylamine works.